Bundle of the Undead. Only One Day Left! 10 Games + 2 Albums! If you still did not purchase Zombusters you still have time for acquiring this awesome bundle with 10 zombie games including Zombusters plus 2 albums and one coupon. There is only one day left to purchase this bundle. Check it out quick! A build-a-bundle; choose between 2-7 games. 2 games (+ Bonuses) comes to $1.50; it then becomes cheaper per game the more you buy. You can buy all 7 (+ Bonuses) for $4.29 [£2.91]. 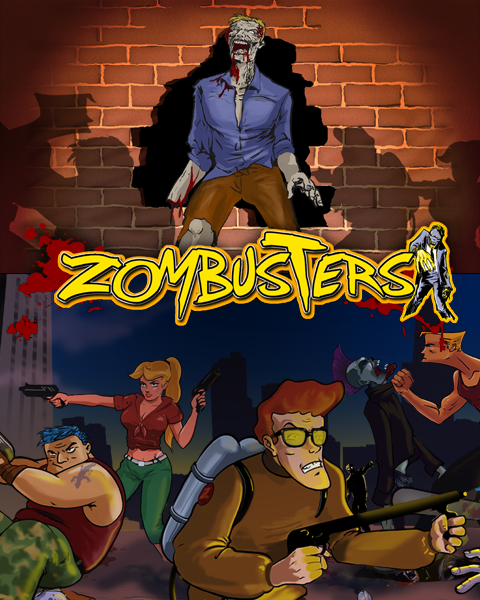 Zombusters available NOW on Desura! Zombusters will be in Desura on July 2nd but if you want to play it before it’s published check out the Groupees Bundle of the Undead. This fun and action-packed game will be available on Desura on July 2nd. This game look like a spin-off "Zombie Shooter" by Sigma Team. Beat the level 5 final wave and the game crashed. Kind of a relief was getting bored. You need some combo system to rack up points, gun variety and a proper way to choose your guns to conserve ammo though its very tedious to stick with the pistol to conserve ammo since it takes forever to kill enemies. Just stuff that makes the game not as much fun as it could be. Also the aiming, just make the arrow keys for shooting instead of the mouse if you are going to keep it just octogonal, otherwise its a very messy aiming system. It's the simplest dual-stick shooter I've ever played. No variety, excitement, or original gameplay whatsoever. This game still needs massive improvements. I can't change resolution, the aiming is annoying (especially when using a mouse) and it feels weird to be locked to a certain portion of the map. The music is okay though. The aiming is a joke the character shoot literally in another angle instead of where the aim is at..
Why does this have an average rating of 5? It deserves so much more than 5. Maybe because for some of us the game remains non functional. Not that I've voted on it myself, but I haven't been able to play it yet either. I got it in the Groupees bundle 3-4 months ago. Is there no way yet to play in windowed mode or to change the resolution? Oops, doesn't look like my response posted! Thanks a lot, I was able to play it in full screen even with the edges cut off, it didn't cut off anything important. RT @krlsprts: On és el botó de reset?